Hand Woven Raw Silk Tallit with Embroidered Atara CAT# TSW- 4. hand – woven, including the colored stripes. The Blessing in the Atara is embroidered. It says: “Asher Kidishanu Bemitzvotav Vizivanu Lehitatef batzizit”. Sizes: 19” X 71”. 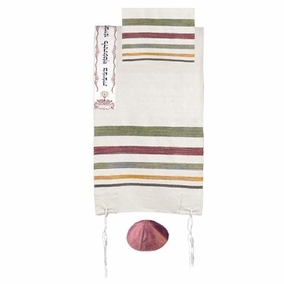 The prayer shawl is worn over one's clothes, and is traditionally worn by Sephardi males from early childhood and by the majority of Ashkenazi males only after marriage; although some Ashkenazis criticize this practice as it delays an important mitzvah beyond the time a Bar Mitzvah male is responsible for it. In some Ashkenazi communities, especially western European Ashkenazim, all men over 13 wear the tallit gadol.